Regardless of the addiction, there is probably an associated 12-step meeting available to those who wish to enter recovery. 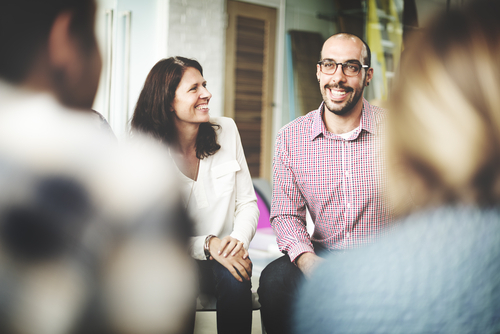 Here are five reasons addicts should attend 12-step meetings. There is no other group of people that understand what it is like to be an addict. Counselors, therapists, and social workers may or may not have personal experience with addiction but you can rest assured that in 12-step meetings, all know what you are going through. Many share the same experiences as you and many are experiencing recovery just like you. All attendees share the same goal-to stop the addiction and live a full life in recovery. Whatever you hear here, let it stay here. This is a familiar saying in 12-step meetings. It means that you are safe to say whatever you need to say in a meeting to help you heal. No one will repeat the information to anyone. Your stories, good or bad, are safe to share with the group. No one judges because everyone in that room is an addict in recovery. The support an addict receives in 12-step meetings is monumental. From the first meeting, one is welcomed with open arms. There is research that validates support as one of the main criteria for recovery and continued abstinence. Support from a group of addicts can help one keep focused on recovery and what one needs to do to maintain periods of abstinence. There is such encouragement in these meetings and many report feeling better about themselves after the meeting has concluded. The support provided by members can help you with urges and cravings. They can also help you in understanding how to avoid relapse. All 12-step meetings are free of charge. There are also many meetings in which to choose from that can work with your schedule. Inpatient and outpatient treatment, individual and group therapy can be expensive. Having a no-cost place in which to share your experience, strength, and hope with others is invaluable. If you have a hard time finding time for a meeting, some are now being offered online. In 12-step meetings, an addict can find or redefine their spirituality. Through the 12 steps of recovery, an addict will learn serenity and connect with a higher power. Hope and a sense of purpose can be found in 12-step meetings that can help the addict flourish.